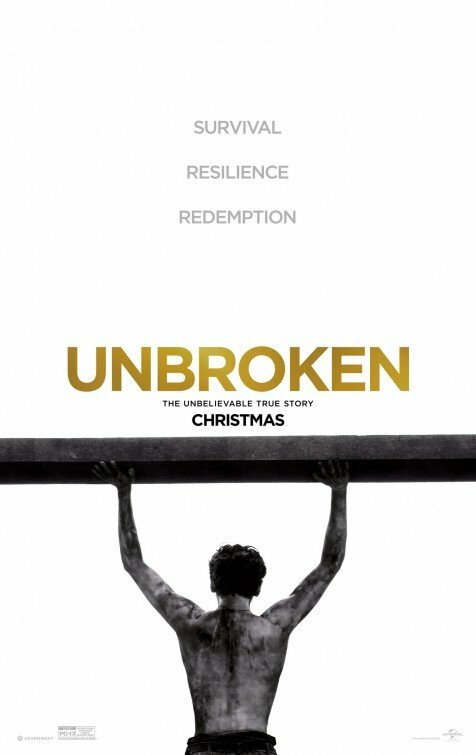 "An Inspiring Story of Redemption"
UNBROKEN, the harrowing and inspiring true story about the life of Louis Zamperini, is an immensely moving adaptation of Laura Hillenbrand’s biography. The movie begins during World War II on a B-24 bomber with Louie and his fellow crewmembers approaching a Japanese controlled island. As they approach, they engage with enemy fighter planes. The crew effectively fights off the enemy and completes the mission, but not without serious damage to the plane and some casualties. By some miracle, they make it back to base and land the plane. In flashbacks, the younger, mischievous Louie gets himself into trouble easily in Torrance, Calif. His churchgoing Italian parents try to straighten Louie out through discipline, but it’s Louie’s older brother, Pete, that really pushes him to strive for more. With the encouragement of Pete, the determined and motivated Louie succeeds at track and eventually makes it to the 1936 Olympics in Berlin. The unquenchable determination Louie shows on the track field carries into the war. After the last battle that destroyed their plane, Louie and a new crew are sent on a rescue mission on an old rickety plane. While over the vast ocean, the engines fail, and the plane crashes. Only three survive the crash and make it to a life raft: Louie, Mac and Phil. Stranded with very little supplies, Louie helps the men keep their sanity and composure amid life threatening elements even though he himself isn’t sure of their survival. In a crucial moment when a violent storm crashes over them, Louie cries out to God and promises to serve Him the rest of his life if he survives. Survive Louie does, but not in the circumstances he wished. Found by the Japanese, the two surviving men become prisoners of war and are thrown into a war camp. Louie catches the eye of a Japanese guard, Mutsuhiro Watanabe, also known as “The Bird” by the prisoners. Louie’s mental endurance and resolve deeply angers The Bird, who becomes Louie’s chief tormentor, determined to break Louie’s spirit. Beaten, starved and stripped of all dignity, Louie remains unbroken against The Bird’s attacks. Bringing the epic story of Louis Zamperini to the big screen proves to be easier said than done. The script is rich with subtext, but anyone familiar with Laura Hillenbrand’s well-researched book will likely wish Director Angelina Jolie had included more. Most notably missing is Louie’s eventual conversion to Christianity, which isn’t entirely forgotten, since it is mentioned in the closing titles. Though many will be disappointed with its exclusion, it’s understandable that the magnitude of Louie’s incredible story can’t entirely fit into an acceptable timeframe for one feature-length movie. UNBROKEN is undeniably inspiring on many levels. The endurance of not only Louie, but of so many of the soldiers who survived the POW camps in World War II is incomprehensible. At the most human level, UNBROKEN is a story about fighting for liberty amid injustice, uncompromising values through persecution, persevering when all is lost, and holding onto hope when there seems to be none left. These aspects are immensely inspiring, but they are given an even firmer foundation when seen through the lens of the Gospel. Whether it be the priest preaching to love your enemy, Louie’s mother praying fervently for her son, a Christian soldier praying, or Louie making his promise to God, Christian faith is present in UNBROKEN from beginning to end. The final titles reveal that Louie forgave his captors because of his eventual faith in God through Jesus Christ. UNBROKEN is by no means an easy movie to watch, but it never becomes gratuitous with its violence. In fact, even the foul language is subdued compared to most movies. That said, the intensity and brutality of the POW camps warrant an extreme caution. (CCC, BBB, PPP, LL, VV, S, N, A, D, M) Very strong Christian, moral worldview extols courage, sacrifice, forgiveness, and holding onto hope, a family goes to church and a priest preaches about the light following the darkness and says to “love your enemy,” a woman prays for her mischievous son, a soldier prays to God and wears a cross necklace, hero promises to serve God if his life is spared and the closing titles say he kept his promise, served God and was able to forgive his captors because of his Christian faith, plus very strong patriotic values, including American soldier refuses to betray his country for better treatment; eight obscenities and three profanities, men empty out a latrine; strong and intense violence, planes are shot down in battle, men are brutally beaten with batons and bamboo sticks, whipped with belts and punched and kicked, main character sets his broken nose, men are shot, and a man’s fingernail torn hands are shown, but no gratuitous gore, though it’s still rough to see; a sexual reference, and main character ogles woman a few times, including from under some bleachers; some “pin ups” are seen in the background on some plane walls, naked prisoners are seen from both front and back, though frontal sensitive areas are covered; young boy secretly drinks liquor; light smoking of cigarettes and cigars; and, mischievous boy steals, though this is not condoned and he is punished, and prisoners of war dress as women for a play they are forced to put on for the guards. UNBROKEN is an immensely powerful biographical movie about the life of Louis Zamperini, who became a famous evangelist. The son of Italian immigrants, Louie goes from being a mischievous young boy to an Olympic runner at the 1936 Berlin Olympics. When World War II begins, Louie joins the Air Force, but a tragic malfunction causes his plane to crash one day. Only Louie and two men survive. Stranded for weeks on a raft, Louie and the other men strive to survive, but bad goes to worse when they’re taken by the Japanese army as prisoners of war. Through extreme hardships, Louie refuses to give up. UNBROKEN is a worthy, well-directed adaptation of the riveting biography by Laura Hillenbrand, but it doesn’t cover Louie’s actual Christian conversion after the war. It’s still an inspiring story about fighting for liberty amid injustice, retaining one’s values despite intense persecution, persevering when all is lost, and holding onto hope when all hope seems gone. Also, the movie extols Christian prayer and loving your enemy. UNBROKEN warrants extreme caution due to some intense violence and foul language.